When creating a new ASP.NET MVC project in Visual Studio, the project will use a Bootstrap front-end framework by default. But there are more sophisticated templates with the extended functionality available. I wanted to use one of those instead of the one provided by Visual Studio. I discovered AdminLTE, a dashboard & control panel theme built on top of the Bootstrap 3.0. 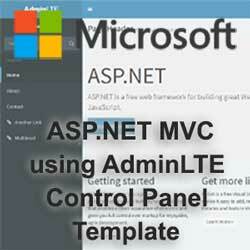 This article will show you how I replaced the default Bootstrap framework with the AdminLTE template in an ASP.NET MVC project. Do you want to create a blank solution in your VS Express but can't find it? I had this issue as well. I mostly code stuff for my personal needs so I never gave much thought on making the code more readable and organized, but on my last WinForms project I wanted to give more attention on how the project is structured. It seemed to me that the best way to achieve that was to start with an empty solution and then add necessary projects to that solution. I had trouble finding this option in Visual Studio, so I decided to write a post about it in case there are others with the same issue.